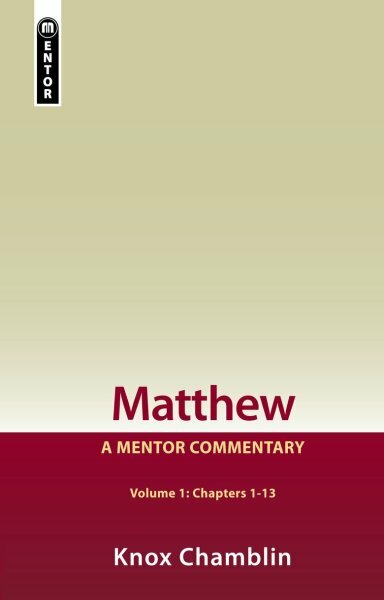 Matthew's Gospel is the first document in the New Testament - a suitable location considering some scholars' opinions (for example, Theodor Zahn and Ernest Renan) that it is the pre-eminent piece of literature in antiquity. What sort of book is it? Who is its author, and why did he write it? What historical, literary and theological contexts influence it? Matthew's Gospel also tells a story of Jesus, the son of David the son of Abraham - accordingly it gives attention to characters, plot lines, conflicts and resolution - but the extra dimension is that it also has an effect upon its reader to direct them to the Savior of the world. Knox Chamblin (1935-2012) was ordained to the gospel ministry in 1971. He did graduate work at Cambridge University, and received his Th.D. from Union Theological Seminary in Virginia in 1977. He taught for thirty-four years in Jackson, Mississippi, first at Belhaven College, then at Reformed Theological Seminary until retirement in 2001.